This Vita57.1 compliant FMC module is supported by two QSFP28 (100G) or two QSFP+ (40G/56G) ports and Texas instruments' Ultra low-jitter LMK61E2 (90fs) programmable oscillator with a fractional-N frequency synthesizer. The LMK61E2 oscillator's integrated VCO generates commonly used reference clocks configurable as LVPECL (1GHz), LVDS (900MHz) or HCSL (400MHz). The startup frequency is factory programmed and generates 156.25MHz LVDS output. The device registers and EEPROM settings are fully programmable in-system via I2C serial interface for easy generation of other industry standard or custom clocks such as 322.265625MHz. The I2C bus can be controlled either by host FPGAs or the on board PIC processor. 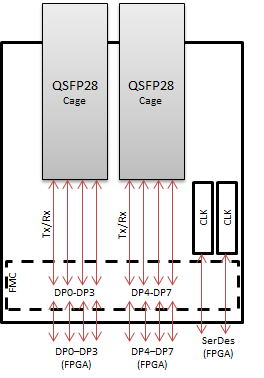 Each QSFP28 /QSFP+ port is directly connected to four multi-gigabit serial transceivers of Vita 57 compliant FPGA carrier boards.